was a Mercedes Benz 190SL, Mercedes-Blue/Navy Leather Interior which I bought in Paris, from a German electronics store owner for $2500 in May of 1965. One of the its features was a 78rpm turntable. I remember driving down the Champs-Elysee in Paris, on a beautiful spring day, listening to "You've Lost That Loving Feeling" by The Righteous Brothers, thinking, "It just doesn't get any better than this..."
The thoughtful German arranged for me to take his car back to his mechanics in Dusseldorf for a complete overhaul. For company, I invited my Norwegian girlfriend, Karen Hansen (see her photo), along for a long romantic week-end. 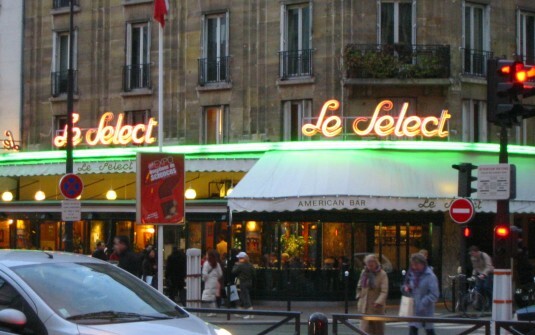 After the brief holiday and back to Paris, we were arriving in there about dusk and Karen asked that we stop by "Le Select" (see photo titled, "Karen Hansen"), a Montparnasse bistro (photo below), to look for her girlfriend, Urie. We saw Urie. And sitting next to her was the MOST BEAUTIFUL WOMAN I have ever seen!